Sometimes you overindulge because it is a holiday. Sometimes you overindulge because you have company in town. Sometimes you overindulge because you’re on a mean streak of cravings for nothing but cheeseburgers. Or you’re in a bad mood or having a hard time at life right now. Or maybe you got a sunburn so bad last week that your doctor put you on steroids. I hear you. It happens. And maybe you wake up and you want something really healthy. Maybe it is because of the overindulgences, or maybe it is just because you crave something that makes you feel good. Granted, a double bacon cheeseburger also makes you feel good, but more in a mental way than a physical way. For me right now, I am in need of something healthy. Something with vitamins and fiber and other similar buzz word nonsense. You know what I’m talking about. Between out of town company and sunburns and eating out all the time and a dozen other reasons, I’ve had too many cheeseburgers lately, I’m feeling the need for a salad. I need some vegetables. And this next recipe, is right up my alley today. This is the Monday restart meal. The, “no really, I’m going to eat better this week” meal. It’s nice to have a plan for dinner. This dish is light, filling, and delicious. It is a side, or a main, or a just got home from work and want to eat something cold straight out of the fridge snack. Basically, it is brown rice that is tossed with some delicious vegetables and thrown together in a casserole with cheese on top. The mushrooms are baked, which is very low maintenance, and the kale and onions are sautéed in one pan. You’ll toss with the rice (you can even use instant rice packets, which are awesome) and put the whole thing into your already hot oven for a few minutes and then you’ll be ready to go! Squeeze a lemon on top if you are feeling fancy. You’ll be amazed at how good something so simple can be. 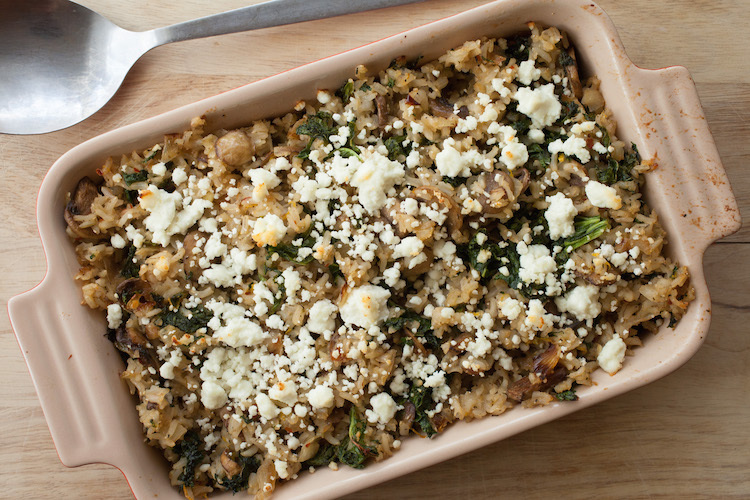 I also like to do this recipe with farro instead of brown rice. Do something nice for yourself today. Make this recipe. Participate in Meatless Monday. Or go get a cheeseburger. Don’t let me tell you what to do. You do you. Preheat oven to 400. Place mushrooms on a foil lined cookie sheet. Toss with 1 TB olive oil, 1/2 tsp red pepper flakes, salt, and thyme. When oven is ready, bake for 12 minutes. In a large skillet, heat 1 TB oil. Saute onion over medium heat until soft and lightly carmelized. Add garlic and cook a minute more. Add kale and 1/4 cup water. Cover and cook until kale is wilted, 3-5 minutes. 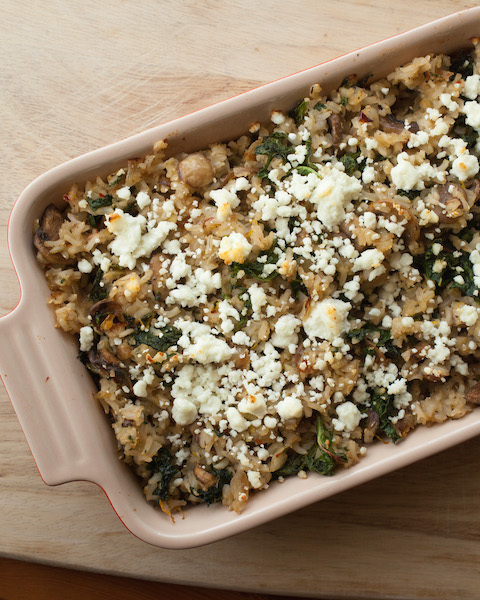 Mix rice, mushrooms, and kale in a large bowl. Be sure to add any juices leftover from the mushrooms or kale. Salt and pepper the mixture to taste. Top with crumbled goat cheese. Bake for 12-15 minutes. This allows time for the flavors to meld together.